Hi, this is Red again. I missed to publish this entry last January. I read this from abs-cbn news online. The title of the article is "Bo Sanchez shares his formula for financial success", posted at 01/03/2014 2:00 PM by Carlos Rodriguez of ABS-CBNnews.com. 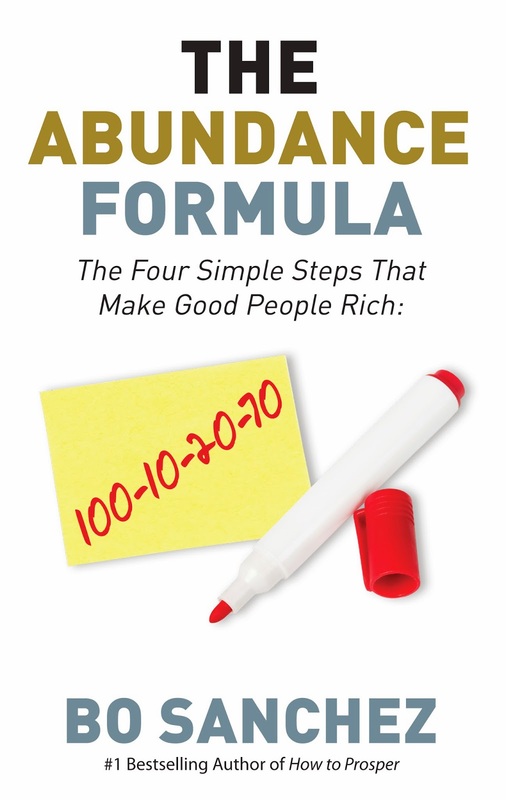 To better understand this formula, you can buy Bo Sanchez latest controversial book on Personal Finance Series entitled "The Abundance Formula - The Four Simple Steps That Make Good People Rich: 100-10-20-70"
I was so lucky to received this controversial book, for FREE. Since I am a member of the Truly Rich Club, they shipped the book to me, no additional charge, for free. Now, for the article I mentioned... please read it below. Being able to gain financial wealth is possible regardless of how much or how little you are earning, inspirational speaker and entrepreneur Bo Sanchez said. Sanchez said following the simple formula “100, 10, 20, 70” can help those wanting to live comfortably and without debt. “You have to earn 100 percent. You have to find a way to say to yourself, ‘I’m going to maximize how much I can earn, meaning utilizing all your gifts, all the gifts that God has given to you,’” he told ANC’s “Headstart” on Friday. It doesn’t matter what profession you are in, Sanchez said, as long as you can “be the best that you can be,” because this may lead to promotions and salary increases. From your income, give 10 percent to charity. “It’s the starting wheels of generosity. Generosity is opening your palm, because when you open your palm then you are ready to receive,” he said. The “20” means investing 20 percent of your income, a concept that Sanchez said he learned from the bible. “Joseph the Dreamer was a governor of Egypt, he had these dreams and then 20 percent of the whole produce, he kept, and then saved Egypt from famine,” he said. 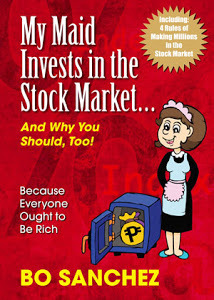 Sanchez also shared that he also taught his house helpers and driver to invest in the stock market to help them grow their finances. “The best and safest investment is in the stock market. People don’t know that,” he said. The remaining 70 percent should then be spent on a simple lifestyle. “Live on 70 percent of your income. Live simply. Make a decision and say, ‘I will not overspend,’” said Sanchez. He added that the secret to success is having big dreams and a system to support it. “Big dreams attract more resources, attract more power and fire in your belly. The bigger the dream, the better,” he said, noting that systems bring success, not just dreams. “The proper attitude, the mentors that you need to put in place, and then the small little steps. It’s not the big things that change people's lives, it's the small things that you do consistently everyday that changes you,” he said.